PIONEER DJM-350 MIXER (Excellent Condition). Condition is Used. Dispatched with eBay delivery – Shutl 1 day. 8 and 10 input models. Inputs: 10 - Mic x6, Stereo x2. What if I have not received my order?. When will I receive confirmation of my order?. Accessories for Trussing. Lighting & Effects. Speaker Hardware. Pioneer DJM 600 in excellent used condition this mixer comes in its original box and there are no fader caps missing at all which seems to be common on ebay. All faders work as they should and the mixer is in fabulous condition grab a bargain. Built-in DSP effects processor. USB port to connect to a computer for recording or playing back digital audio to/from computer. One pre-fader monitor send. Rugged console design. Pioneer DJM 600 Professional DJ Mixer in fantastic condition and perfect working order. Any questions then please feel free to contact me. TURNTABLE MIXER. GREAT MIXER. A DENT TO ONE CORNER- SEE PHOTOS. SCRATCH PRO 100. Bottom right corner is slightly bent. Edges are worn. But still in good working order. New listingPioneer DJM 600 mixer in Good working condition. Pioneer DJM 600 mixer in Good working condition.. Condition is Used. Dispatched with eBay delivery – Shutl 1 day. Deejay Djcontrol Instinct S Series. Condition is New. Dispatched with Royal Mail Signed For® 2nd Class. Bought 6 months ago from BopDj. IN PERFECT WORKING CONDITION. PIONEER DJM 450. Good condition with time code vinyl & Activation codes. 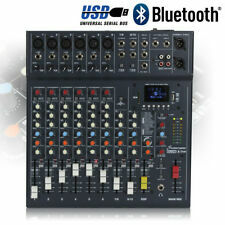 DJ Mixer - Gemini Professional Preamp Stereo Mixer PS-626-PRO 2 . This item is used I no longer have decks so I can’t test this but it powers on fine last time I used it the cross fader was a bit crackly on one side so may need a clean or replacing. This is unboxed and will be posted 2nd class signed for. Any questions please ask. Rane 61 mixer with Serato soundcard built in. Two fader carriers were broke, its a common issue on all rane mixers that the plastic carriers break. Apart from one rubber cover on the blue know its a clean mixer and fully working. They cover needs ranging from corrective equalization to boldly creative sound-shaping, giving you a variety of EQ responses and curves, filter characteristics, and even isolator modeling that can be switched independently for each channel as needed. 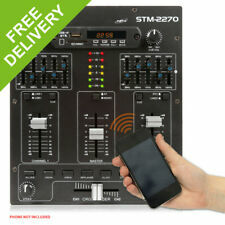 New listingNumark DXM 06 DJ Mixer, 24 Bit With Effects. Boxed. Pioneer DJM-250MK2 - mint condition. Dispatched with eBay delivery – Shutl 1 day Bought 1 year ago and has been kept in the box for pretty much the whole time. Item hasn't been used other than to test it. Comes with all the cables, box, manuals etc. I installed the rekordbox that came with it but I'll uninstall/transfer the licence. 2 Channel mixer with 16 DSP effects. USB / BT player. DSP with 16 built-in effects. Selectable & adjustable CUE function (headphone monitor). Scratch function on the master output. Main out: max. 5V (line input). The gooseneck is fitted with a standard BNC plug. Flexilight 12V Gooseneck Light BNC. Bulb type: 12V 5W BC tubular. AC or DC Input: 12V (not supplied). Colour: Black. The LED display progresses from green through amber, to red. Designed to set in an amp rack to view your decibel level. Creates a great light show in your amp rack. 2 separate modes: dot and bar. Display progresses from green through amber to red. CITRONIC CLP1200 12-CHANNEL POWERED MIXER. This powerful yet affordable 600w (wrms) mixer is sleek, versatile and is every bit as comfortable in a live setting as in a studio, say hello to the Citronic CLP1200! SynergyT 10 00, ne w ol d st oc k ,missing 2 fader plastic knobs, te st ed a nd working, 2 channel wi th m ic input, p os t to Uk main land only, good luck. Here I have a Pioneer DJM 600 mixer. • 300W power giving clear sound. Pro Karaoke Amplifier - simply connect to Passive Speakers. • 2 Channel amplifier with two outputs which allow you to connect various passive DJ speakers to achieve the sound you are after. INNOFADER MINI PLUS : (fully adjustable). The RPM-100 Portable Mixer was created to up your portable skratch and mix experience. The perfect hybrid mixer. a portable beast, highly capable and worthy also for studio indoor use!